The relationship between genotoxicity and cancer has been extensively demonstrated and is well accepted; however, the role of epigenetic regulators that are involved in genotoxic events and carcinogenic processes is less understood. Epigenetic mechanisms are known to play important roles in carcinogenesis, and connections between epigenetics and DNA damage and repair have been reported. 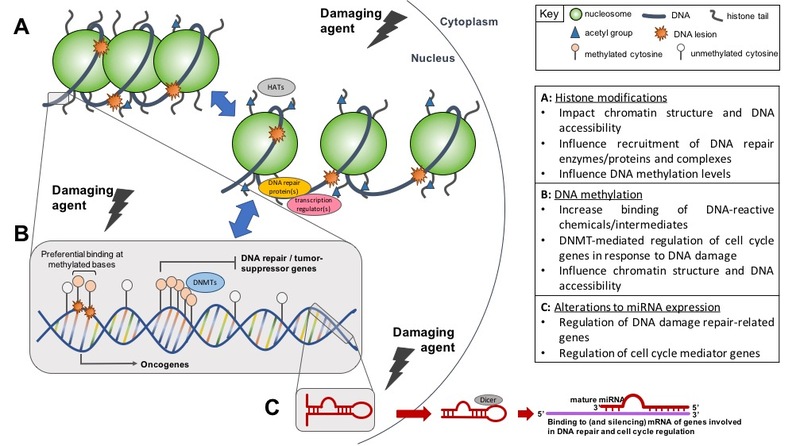 This mini review discusses some of the known relationships between epigenetic mechanisms and DNA damage, focusing on DNA methylation, histone modification, and microRNAs. Examples include: (i) preferential binding of reactive chemicals or metabolites to methylated cytosines at mutational “hotspots” that lead to carcinogenesis, (ii) histone modifications that affect chromatin structure, resulting in altered accessibility of DNA to damaging agents and/or DNA repair machinery and/or recruitment of DNA repair machinery to sites of damage, and (iii) changes in abundance of microRNAs that regulate the expression of genes involved in DNA damage response. Still, there remains a need for further research on these topics, as key findings on epigenetic alterations will advance the understanding of chemical-induced cancer, including cases that involve genotoxicity. A better understanding of the role of the epigenome in chemical carcinogenesis will contribute to improvements in human health hazard assessments and screening efforts for potential carcinogens.